Saira and Archer’s London summer is carefree and romantic, until a brazen attempt to capture Saira looks suspiciously like the handiwork of the Descendants of War. 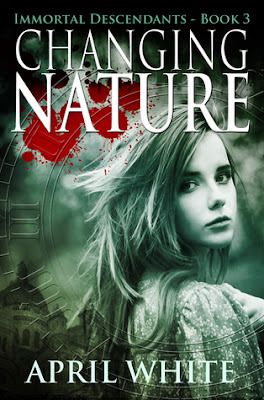 When the kidnappings of other Descendants come to light and Mr. Shaw is taken for questioning under threat to his family, Saira realizes that for herself and young Shifter Connor, Time is the only refuge. But one danger is merely exchanged for another. Believing that their time-warping nemesis Bishop Wilder may have fled Elizabethan England for medieval France, Saira and her friends emerge onto the gloomy streets of Paris in 1429 to find it besieged by marauding wolves. When they encounter an illiterate peasant girl, whose deeds as Joan of Arc are extolled in an obscure sixteenth century book, but are unknown in their modern history, they realize the wolves may be the least of their problems. As Saira, Archer, and Ringo reunite to track down Wilder, they are faced with increasing evidence that time has been split and history altered. Crossing the time stream to repair it drops them in the heart of a battle, where friends are enemies, and foes are lethal. And in a fight for their lives, they encounter an old friend to whom Time as not been kind. To help him heal and end the deadly game of cat and mouse with Wilder once and for all, Saira must confront her greatest challenge yet: the truth about her changing Nature. When I started reading Changing Nature my very first thought was "wow, Saira really did grow up." The writing and story, her character, felt much more adult and less teenager. There is a bit of time between this book and the last one and it was surprising how much I could tell that her character had changed just from how she was written. I loved it. Saira was finally who I knew she would be by the end of the story. In book one she started off as a bit...whiny teenager, was still a bit of that in the last one, but now she is on it. She is with her family, the people she has collected who she cares for deeply, and she does what she needs to do, but with their help. She is no longer that kid that only thinks of herself. I loved it and I can't wait to see where she goes from here. In this installment we have a lot going on. Descendents are being captured, including Mr. Shaw, and Saira is on the list. Why half-bloods are being taken by Mongers they don't know, but they do know it needs to stop. Besides that they also have to look out for Wilder and see if they can find where he clocked to at the end of the last book. Now the one small thing that bugged me in this story - Tom went through the spiral with Wilder at the end of the last book and so everyone assumes Tom is dead. Though when I saw that I thought oh no! Now Wilder will drain his blood from him and try and get Tom's skills. But no one else thought of this possibility for some reason. Every time it came up I found it odd, but not that big of a deal. So between being hunted and looking for Wilder in 1429 things are a bit complicated. Now Saira and crew go back to 1429 to try and stop a time split like Wilder caused in the last book. He must have done something again to change the course of history and they have to fix it. Along the way they meet Joan of Arc and oh my did I love her! Or love how she was portrayed. She was fun even if she may have caused some problems. A few other surprises along the way and this was for sure an adventure. Saira, Archer, Ringo and a few friends have a lot of heavy things happen in this story. A lot of things that could stick with them. Not to mention Tom and what happens to him (we do find out what happens once he went through the portal with Wilder). I really enjoyed this chapter of the story. The characters are really a team, really tight and I loved it. I know more people will try and take them down in the coming books, but I don't really see how they will succeed. It was awesome, but they may have to make some hard choices coming up. Do some things they might not want to do, especially Saira. She struggles more with right and wrong and hurting people who are trying to hurt her and her friends. I can't wait to see what happens next.